There are certain periods in history that are strongly connected to astrological patterns of slow moving planets. The Great Depression of the 1930s was tied to the Uranus in Aries square Pluto in Cancer aspect of the time. The slow moving planets do create patterns that affect whole generations. This same pairing were in conjunction in Virgo in the mid sixties. The harmonious aspect created a time of relative prosperity rather than the economic hardship of the square aspect with a technological and cultural revolution that truly impacted on a whole generation. As other slow moving planets added aspects to this conjunction the focus of change became sharper. The spring of 1965 saw Saturn in Pisces in opposition to Uranus and Pluto. Jupiter’s transit through Gemini created a T Square. This was a time of great change, particularly in Britain with a Labour government ( Uranus and Pluto in Virgo, the sign of the workers ). But what about the people who were born then and had it in the charts ? In terms of instinctive familiarity with computers people often talk about the difference between those born before and after 1965. It is this Uranus / Pluto in Virgo that they are talking about. Particularly those born in this year with their lights involved. When it comes to computers Capricorn Research is definitely of the pre 1965 dinosaur era and is more comfortable with an abacus. But my brother in law was born in 1965 and had the Sun in Virgo conjunct that Uranus / Pluto and is a computer genius. But these kinds of patterns are tricky ones. You only have to add a bit more planetary spice to the pot and it can quickly become too hot to handle. We only need to add Mars to this picture and it can easily produce fireworks. It certainly did in the case of Susan DeAngelo. Whereas a Uranus / Pluto conjunction in Virgo would probably point to a nerdy computer whizz kid, a Mars / Uranus / Pluto conjunction in the sign could easily turn it into someone who is equally cool and analytical but is also prone to sudden unexpected acts of violence. No doubt her Sun in Taurus and Moon in Capricorn added to this sense if calm and self çontrol. She married in 1994 but split up a few months later. This seemed to start the peak of her criminal period. She was arrested 16 times on charges ranging from trespassing to armed robbery, between 1993 and and the bank robbery in 2002. Pluto was opposite her Sun between 1994 and 96, it then formed a Grand Cross to her T Square planets between 1997 and 2002. The FBI nicknamed her Charlestown’s Bonnie (after Bonnie Parker ) but astrologically she had more in common Bonnie’s notorious partner Clyde Barrow. 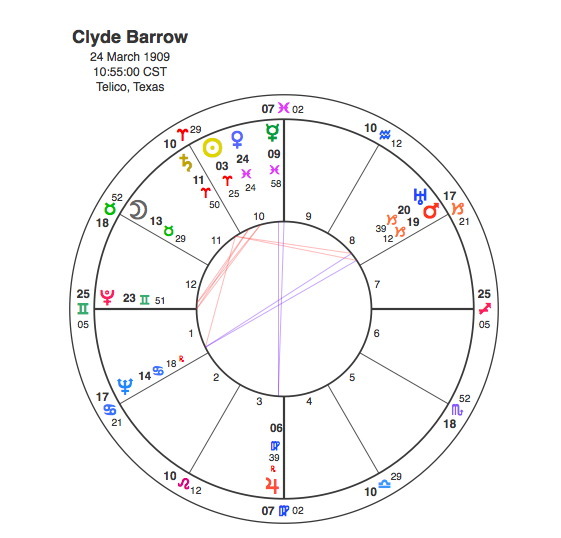 Clyde Barrow was born in 1909 when there was another T Square between slow moving planets. Uranus in Capricorn was opposite Neptune in Cancer focusing onto an apex Saturn in Aries. This is a difficult combination and the generation that were born with this were in their early twenties during the Depression. But this aspect on its own is not that of a hardened criminal. 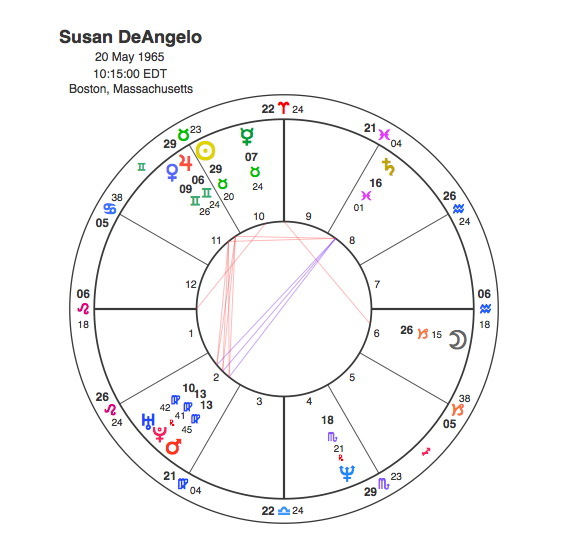 But Barrow like DeAngelo had Mars join the party with a close conjunction to Uranus. Bonnie and Clyde’s life of crime was also focused on Pluto’s transit through Barrow’s T Square, particularly its opposition to Mars and Uranus in 1930 – 2 as they became public enemy no 1. When there are major aspect patterns of the slow moving planets, people who have their Sun connected to the pattern can often become representatives of their generation, those with Mars in the pattern can it seems take up this role in a rather different, more notorious fashion.